The Nanodrop is one of my favourite pieces of equipment in the lab. In exchange for just 1 μL of sample, not only do you receive measurements of concentrations, the purity of the sample is also determined. In this article, I will explain what the Nanodrop results mean and how you can use them to deduce what is actually in your sample. The obvious measurement that the Nanodrop produces is the concentration of the sample in ng/uL. Quantifying isn’t the Nanodrop’s strongest attribute. Since it uses ultraviolet absorbance, the quantification capabilities are far inferior to the Qubit. So, it is not recommended to measure samples with less than 10 ng/uL of nucleic acids. Another point to keep in mind is that both DNA and RNA absorb at 260 nm. So, if you have an RNA sample that has not been DNase treated, the concentrations could be affected by contaminating DNA. The only way to get an accurate reading in this instance is to use fluorimetric methods, such as the Qubit, which can specifically quantify nucleic acids. The main reason people use the Nanodrop is to deduce the purity of their samples. This is generally indicated in two ratios: 260/280 and 260/230. These numbers correspond to the absorbance at the wavelengths 230, 260 and 280 nm. Notice that the curve given by the Nanodrop can actually be really informative – so don’t just focus on the ratios. The curve you should expect is similar to that seen above. There should be a nice peak at 260 nm, which indicates the presence of nucleic acids, and no peaks elsewhere. If there are double peaks or shifts in the curve, these are vital warning signs that the sample is not pure. 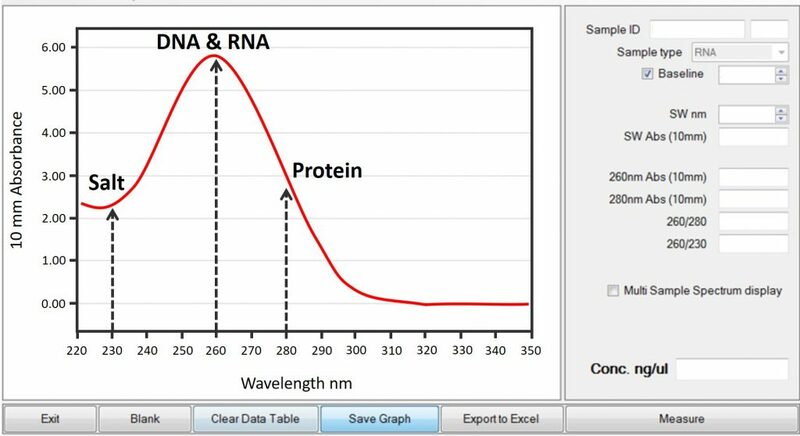 The 260/280 ratio gives an indication of how pure the sample is from contaminating protein. Since proteins absorb at 280 nm, a low 260/280 ratio indicates the presence of high amounts of protein, relative to nucleic acids. What is the optimal 260/280 ratio? The reason the ratio for pure RNA is slightly higher than DNA is due to the increased presence of uracil bases. Thus, the 260/280 ratio can also suggest which nucleic acid is predominant. Generally, anything less than 1.70 I would avoid using. Simply, protein contamination can inhibit many downstream applications, such as qPCR and bisulfite pyrosequencing. To improve 260/280 ratios, the best was is to go back and remove the contaminating proteins. So, applying more proteinase K enzymes and incubating overnight can help. After cleaning up the samples again, the 260/280 ratio may improve, however, some loss of nucleic acids may occur. Alternatively, if the sample has a low concentration of nucleic acids to start with, it may be best to go back to the source (e.g. cells, tissue) and re-extract the whole sample. The 260/230 ratio is a value that reflects how pure the sample is from salts and other contaminants which can absorb at 230 nm. Examples of these contaminants include EDTA, phenol and guanidine hydrochloride. What is the optimal 260/230 ratio? Pure nucleic acid samples have a 260/230 ratio of 2 or above. Anything less than 2 suggests that there are other factors in the sample. If the 260/230 ratio is low, it is worth cleaning the samples using spin-columns or by re-precipitating them. Adding more wash steps during these processes can help remove the contaminants. However, doing so can also result in the loss of some nucleic acid. But, the loss of a little bit of quantity is worth it for purer samples. I recommend you read our earlier article regarding hints and tips when using the Nanodrop to measure nucleic acids. By following these tips, you will ensure your readings are reliable and accurate.